Ezekiel chapters 25-32 details Divine judgments against nations that have risen up many times against Israel as their adversaries. There are seven people groups singled out, and the text divides them in two groups. The first is a group of four that includes Ammon, Moab, Edom and the Philistines. The second group is a group of three that includes Tyre, Zidon and Egypt. 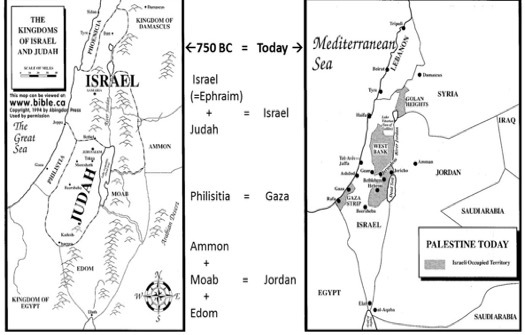 Ammon, Moab, Edom and the Philistines are immediate neighbors to Israel. Their presence posed a constant spiritual as well as physical danger to Israel’s relationship to God and seemed to be a persistent frustration of the Divine plan for the Nation Israel. Most Bible teachers and commentators avoid specifying a time as to when these judgments will take place, but all accept that they have not yet occurred. When one sees the entire Bible as one long chronological story, the period of the timing of the judgment is brought into focus. 1O God, keep not thou silence: Hold not thy peace, and be not still, O God. 2For, lo, thine enemies make a tumult; And they that hate thee have lifted up the head. 3They take crafty counsel against thy people, And consult together against thy hidden ones.4They have said, Come, and let us cut them off from being a nation; That the name of Israel may be no more in remembrance. 5For they have consulted together with one consent; Against thee do they make a covenant: 6The tents of Edom and the Ishmaelites; Moab, and the Hagarenes; 7Gebal, and Ammon, and Amalek; Philistia with the inhabitants of Tyre: 8Assyria also is joined with them; They have helped the children of Lot. Selah (ASV, 1901). Some have written that this Psalm teaches that these nations will come against Israel before the Great Tribulation, and prior to the allied invasion described in Ezekiel chapters 38 and 39. As we will see they already have come against Israel. But the case in point is that this Psalm does not describe an invasion of Israel by these nations, just a hatred of Israel. Since the days of Abraham, there has been a long standing, adversarial relationship between the progeny of Isaac and Ishmael. God promised a covenant to Abraham along with a special child to receive the covenant that would come from his loins. It began in Genesis with the barren Sarah giving Abraham her Egyptian handmaid, Hagar, as a concubine to produce a child for him. That child was Ishmael. Sarah later had a child of her own, Isaac, and he would receive the covenant promise (Genesis 16:12). Isaac had twin sons, Jacob and Esau, and it was his son Jacob who received the covenant, and his twin brother Esau did not. In reaction to this, Esau married into the Ishmaelite family, thereby adding people to the group in conflict with Israel. This animosity has been obvious since the time of Abraham, and it was still there during the Exodus (Numbers 20:14-21), and into more modern history. In the fall of 1947, the United Nations voted to give Israel sovereignty over the piece of land on the eastern end of the Mediterranean Sea. Israel declared statehood on May 15, 1948. 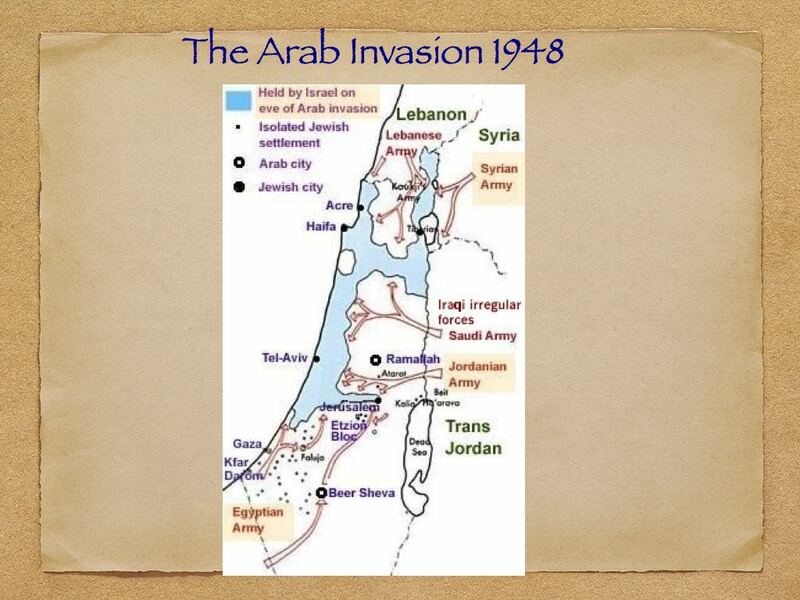 A coalition of five Arab armies from Egypt, Syria, Transjordan, Lebanon and Iraq immediately invaded Israel. A Nazi collaborator, Hajj Amin al-Husseini, led the Arabs of the former British Mandate of Palestine (a post-World War I division of Israel). He was charged at the Nuremberg trials before escaping in 1946. Al-Husseini actively supported Hitler’s aim to exterminate the Jews in World War II. Israel prevailed over all the military efforts of these cited nations to destroy them. The Arab nations failed miserably to destroy Israel. 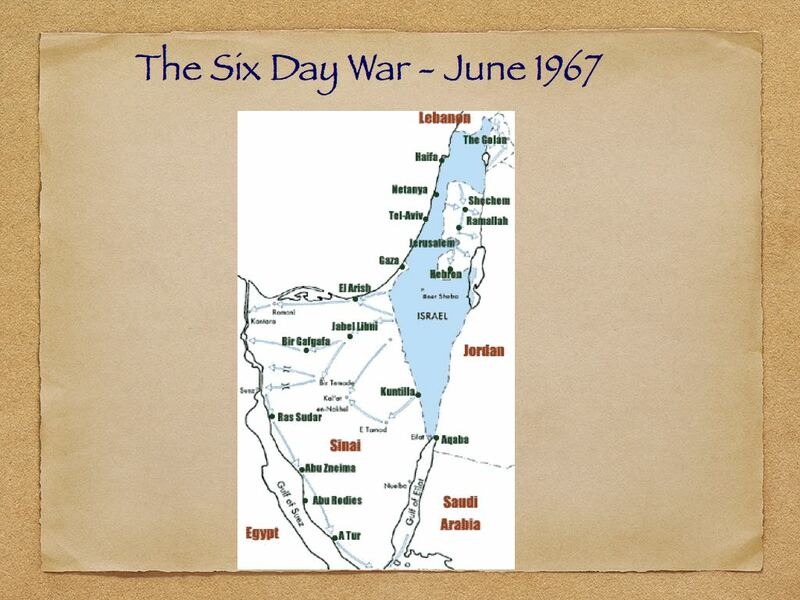 Following the 1948 Arab–Israeli War, in the period leading up to June 1967, tensions increased dangerously. In reaction to the mobilization of Egyptian forces along the Israeli border in the Sinai Peninsula, Israel launched a series of preemptive airstrikes against Egyptian airfields. On May 15, 1967 Nasser ordered a blockade of the Strait of Tiran. This blockade cut off Israel’s southern access to the Red Sea and beyond. 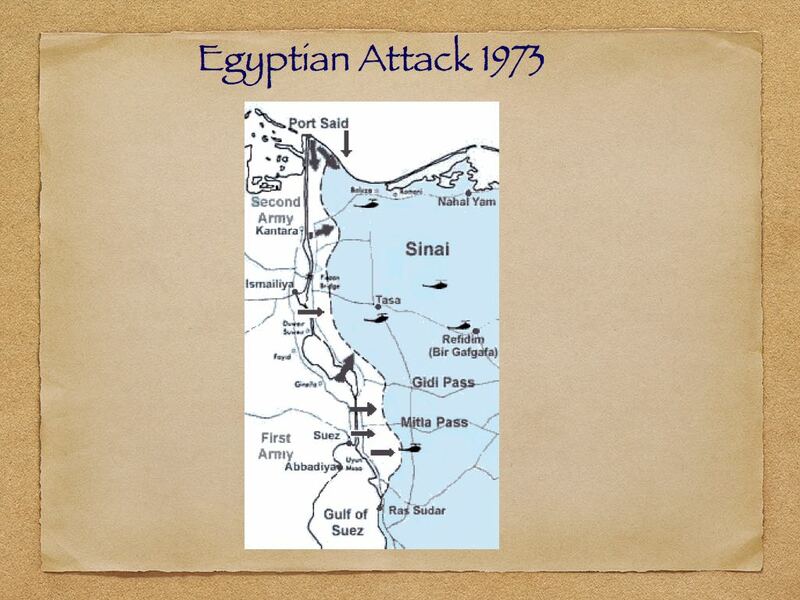 By May 31,1967 Egypt had moved 100,000 troops, one thousand tanks, and five hundred heavy guns into the Sinai. 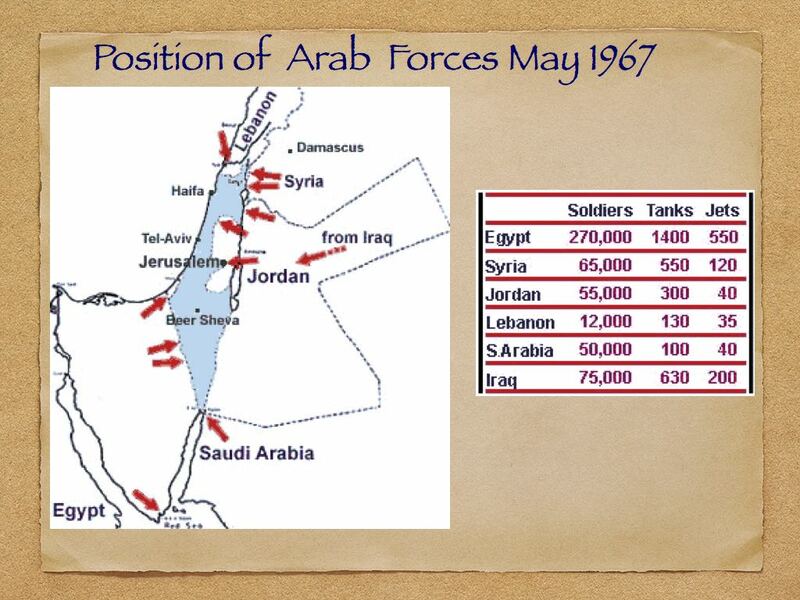 By June 4, Arab forces outnumbered Israel three to one as they poised on Israel’s borders. 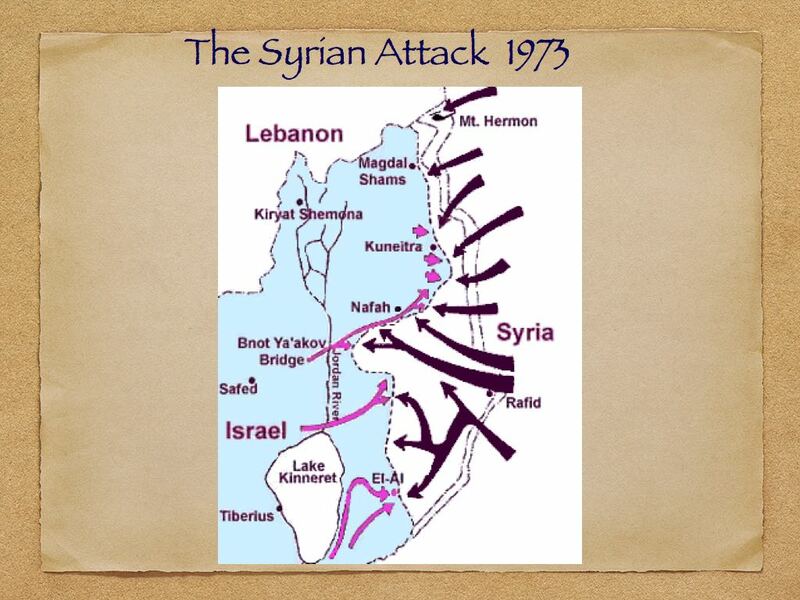 This was Israel’s Six Day War and it was fought on three fronts, against three countries, in three overlapping stages. In the south, Israel engaged and defeated the Egyptians. In the central region, Israel engaged and defeated the Jordanians. In the north, Israel engaged and defeated the Syrians. In each of these theaters, Israel gained significant territory that would serve as its own buffers in future years. On the morning of June 5,1967, the Israeli Air Force destroyed almost the entire Egyptian Air Force (more than three hundred planes) in less than three hours. Israel’s armored divisions, under the leadership of General Ariel Sharon, also launched a lightning attack on the same day. After some initial resistance, Egyptian leader Gamal Abdel Nasser ordered the evacuation of the Sinai. Israeli forces rushed westward in pursuit of the Egyptians, inflicted heavy losses, and conquered the Sinai. Nasser later acknowledged that eighty percent of Egypt’s Russian-supplied military equipment had been lost in the Sinai debacle. Finally, at 8:00 p.m. on June 8, Nasser accepted a cease-fire. On June 11, 1967 a ceasefire was signed. Arab casualties were far heavier than those of Israel with fewer than a thousand Israelis killed compared to over 20,000 from the Arab forces. More than eight hundred Egyptian tanks had been destroyed, and thousands of soldiers were taken as prisoners of war. Nasser later acknowledged that eighty percent of Egypt’s Russian-supplied military equipment had been lost in the Sinai debacle. Finally, at 8:00 p.m. on June 8, Nasser accepted a cease-fire. However, there has been no settled peaceful relationship between them. After a third war in 1973, the Arab nations turned to terrorism (known as the Intifada), to attrition, and to “trying” Israel in the world press as a means of combat. God has obviously caused the Israelis to regain their land after being out of it since 586 B.C., for is a total of 2,533 years. As described, He has allowed them to prevail in several large-scale wars in which the nations in Psalm 83 state a desire to exterminate the Jews, but always lose militarily. These prophecies in Ezekiel chapters 25-32 and in Psalm 83 seem to indicate a Divine, permanent, and severe judgment against those nations. Other Scriptures indicate a restoration of a relationship of varying sorts between these nations and Israel (Ezekiel 35:6-9; Isaiah 19:18-22; 23-25; Jeremiah 49:28-33; 34-39 etc.). Since there has not been a restoration of relationship between these nations and Israel as of 2018, it is necessary to consider when this might occur on the long chronological timeline of human history as laid out in the Bible. These judgments have had a partial fulfillment, a past fulfilment, and the complete fulfilment is yet to come. The prophetic Word shows that the nations who have sinned against Jehovah and His people will be judged in “a coming day”, when Israel will be restored and be blest in the Millennial Kingdom. This is evident when we read the future promises to His covenant people Israel in Ezekiel 28:24–26 and 29:21. These unfulfilled promises concerning Israel’s restoration and spiritual prosperity make it clear that these judgments will be end time events, also known as the “latter”, or “last days”. 7For nation shall rise against nation, and kingdom against kingdom: and there shall be famines, and pestilences, and earthquakes, in divers places, 8All these [are] the beginning of sorrows (KJV). According to all three synoptic Gospel writers, the sign of the end of the age is said to be when “nation shall rise against nation, and kingdom against kingdom”. This act will be coupled with famines and earth quakes in various places, and Jesus clearly stated that this would be the beginning of travail (“sorrows”). The term “travail” beans “birth pang”. It refers to the series of birth pangs that a woman undergoes before giving birth to a baby. The Jewish prophets also pictured the “last days” as a series of birth pangs before the birth of the Messianic Age, also known as the Millennial Kingdom. The beginning of travail, the first birth pang, and the sign that the end of the age has begun is when “nation rises against, nation and kingdom against kingdom”. 1Behold, Jehovah rideth upon a swift cloud, and cometh unto Egypt: and the idols of Egypt shall tremble at his presence; and the heart of Egypt shall melt in the midst of it. 2And I will stir up the Egyptians against the Egyptians: and they shall fight every one against his brother, and every one against his neighbor; city against city, and kingdom against kingdom. 3And the spirit of Egypt shall fail in the midst of it; and I will destroy the counsel thereof: and they shall seek unto the idols, and to the charmers, and to them that have familiar spirits, and to the wizards. 4And I will give over the Egyptians into the hand of a cruel lord; and a fierce king shall rule over them, saith the Lord, Jehovah of hosts (ASV, 1901, underlining added). 1And the Spirit of God came upon Azariah the son of Oded: 2and he went out to meet Asa, and said unto him, Hear ye me, Asa, and all Judah and Benjamin: Jehovah is with you, while ye are with him; and if ye seek him, he will be found of you; but if ye forsake him, he will forsake you. 3Now for a long season Israel was without the true God, and without a teaching priest, and without law: 4but when in their distress they turned unto Jehovah, the God of Israel, and sought him, he was found of them. 5And in those times there was no peace to him that went out, nor to him that came in; but great vexations were upon all the inhabitants of the lands. 6And they were broken in pieces, nation against nation, and city against city; for God did vex them with all adversity. 7But be ye strong and let not your hands be slack; for your work shall be rewarded (ASV, 1901, underlining added). In this passage the idiom states that the conflict encompasses the entire Middle East. In the Olivet Discourse it is the whole world that is in view. This is clear from Matthew 24: 14; 21; 30 and 31. So, this idiom refers to a worldwide conflict, and this worldwide conflict is the first birth pang, signifying that the end of the age, and that the “last days” have begun. The Rabbis clearly taught that a worldwide conflict would signal the coming of the Messiah. Jesus corrected this idea slightly, for He said that when the world war occurs, while it does not signal the coming of the Messiah, it will signal that the end of the age has begun. These “birth pangs” that He talked about are the same as the “footsteps” the rabbis talked about. “The footsteps of the Messiah” had to do with a series of events that led up to the coming of the Messiah. World War I (1914-1918) was the fulfillment of this particular prophecy for that was the first time the entire world was at war. World War II was a continuation of World War I because it involved the same participants and was fought over the same issues. Both wars had a significant impact on Jewish history. World War I gave impetus to the growth of the Zionist movement, and World War II let to the re-establishment of the Jewish State. Since World War I, history has entered the “last days” of the Church Age. However, the “last days” are an extended period of time. We do not know when the end of the “last days” will occur. The “last days” are a period that includes the consummation of the Church age and the Great Tribulation. The period of the “last days” up to the beginning of the Great Tribulation is unrevealed in Scripture. The Great Tribulation is seven years long. The sign that the end of the age has begun is the worldwide conflict fulfilled by World War I and World War II. Therefore, our pinpointing the events of the judgment of the nations surrounding Israel seem to place themselves in the “last days”. Specifically, with the Great Tribulation still in the future, and the Arab nations continuing to be at odds with Israel, it is reasonable to place these judgments at the end of the Great Tribulation when all animosity toward Israel will end. It may also be at the beginning of the Millennial Kingdom when Israel is at peace with all nations, and the Messiah is governing the world from His throne in Jerusalem. This state of the earth after the Great Tribulation is one where wickedness and sin has been defeated (Isaiah 13:9), and the animosity of the nations toward Israel will be over. Sachar, Howard M. A History of Israel from the Rise of Zionism to Our Time: 2nd Edition. New York: A Borzoi Book, 1976. Reprint Alfred A. Knoff, Inc.,1996, 333. Fruchtenbaum, A. G. (2003). The footsteps of the Messiah Rev. ed.,Tustin, CA: Ariel Ministries. pp. 626–627.